Earn $2.47 in VIP credit (247 points)What's This? Shimano's Deore XT and Ultegra components have long been bastions of durability and precision with trickle-down technology from the race-specific XTR and Dura-Ace groups. The CN-HG93 9-speed super narrow chain is strong, durable, and shifts crisply. Zinc-alloy plated outer plates with gray inner plates. 116 links. 294 grams. BTD offered a really great price on this Ultegra 9-speed chain, so I snatched up a bunch of them. My main bikes - road, touring & mountain - are all 9 speed, so these will keep me supplied for years. My experience has been that the ultregra will last for many years. I've had excellent results with the Shimano narrow chains for my 3x9-speed commuter over the years. These chains perform for extended mileage, I typically get 8000 miles for a drive train with Shimano chains during year-round commuting. I'd like it if they came with more than one connecting pin, or packaged together with a quick link, but those are available separately. The chain will keep it together. Upgraded 2004 Ultegra 9 spd rear der. with Shadow 9 spd rear der. & needed chain32 tooth cassette. Both the chain and cassette are from BTD. Both products are Shimano XT compatible with Ultegra. park. Easy swap from Ultegra to XT components. 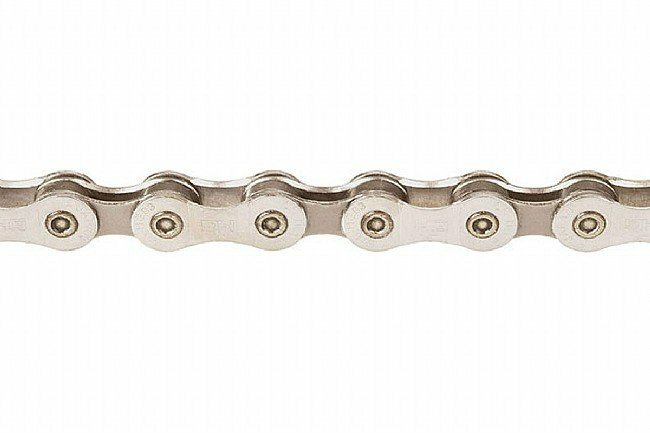 This chain works with my 9-speed road and mountain bikes. It is strong and durable. The pin system is easy to install. I have always been happy with Shimano components. I bought this to upgrade from the chain that came with the bike. The quality difference was noticeable but the price was a little step. I have used the Shimano CN-HG93 for other bikes and it is a smooth, long lasting chain. I recommend this product. Great chain with long life. I bought the bike used with the chain already on the bike. I do not know how many miles it had on it when I got it. I have put 10,000 miles on the bike with the chain with routine cleaning with Simple Green and lubing with Purple Extreme with less than 34% wear indicated using chain measuring tool. I clean and lube every 400 miles or so and more often in wet riding conditions. Main use of the bike is road rides. I highly recommend this chain.